A biker in the mass ride that ended with Alexian Lien dragged out of his Range Rover and beaten in a Manhattan street claims that Lien started the whole incident with a hit and run. And this witness might have video evidence to prove it. 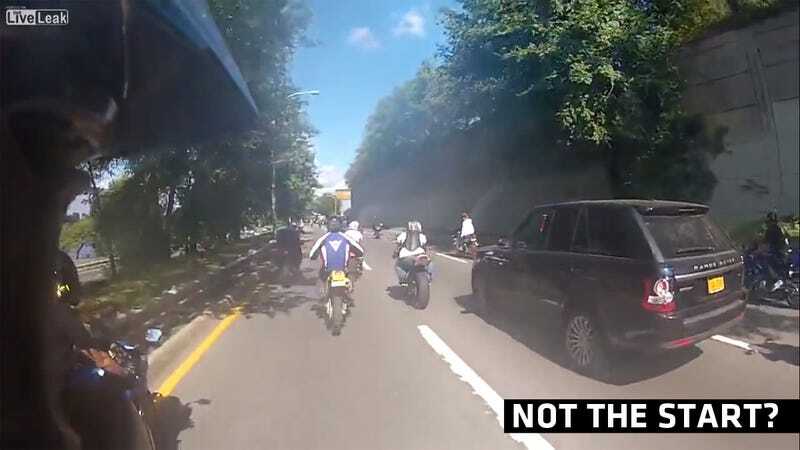 Witness Michael Anthony of Pennsylvania claims to have been part of the huge biker ride that got caught up with Alexian Lien claims that the SUV driver knocked over a biker early in the ride, about two or three miles before the now-viral video of the attack starts. In an exclusive interview with the PIX 11 News, Anthony claims that Lien refused to stay in the right lane as bikers passed on the left. Anthony claims that Lien moved over into the center lane, knocked a driver off of his bike, and then continued on without checking on the person he hit. Riders then chased after Lien, tried to slow him down, and that's when the now-viral video begins. Now, I say that Anthony 'may' have video evidence, because he's not really sure himself. In the PIX 11 News interview, the witness claims to have recorded four hours of video of the ride on his helmet cam but he hasn't had time to go through the footage (he's busy with a family and a full-time job) and he's not even sure if any of the hit-and-run incident he describes was even recorded. The way that the GoPros work... I don't know, I don't know if the card was full, if the battery was dead...I don't know what I have. Maybe I'm just a snotty kid Internet user, but if I was a guy who bought a helmet cam to record my motorcycle rides, of course I'd want to watch the video, particularly if it possibly contained key evidence in an ongoing case that involves a fellow rider getting run over and potentially paralyzed as well as a family man getting dragged out of his car and beaten.